In the spring of 2005 my wife and I were eagerly awaiting the arrival of our first child. Like most people we expected a healthy baby and a normal delivery. In the last two weeks, however, we discovered that all was not well. For some reason our girl was failing to thrive in-utero. Delivery by emergency C-section revealed an apparently healthy but tiny little girl. Perhaps it was fortunate that we were amateur parents; 3lbs 13oz didn’t terrify us then as it would now. Our daughter Alice gained weight and seemed to fine to us, but a visiting nurse who was assigned to our case because of Alice’s low birth weight was keener in her assessment. What we and our pediatrician missed—slight motor difficulties and some perceptual differences, the nurse saw. She suggested we get a genetic assessment and put us in touch with the Genesis Foundation. 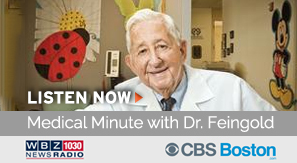 That was the start of our affiliation with Dr. Feingold. We first visited him at his offices outside Boston when Alice was perhaps a year old. By this point my wife and I were sad and confused. Frankly, lacking a clear diagnosis, I admit that we were felt a measure of shame and guilt. There was nothing we did or didn’t do that could have prevented Alice’s difference, but that didn’t matter. Into this milieu of confusion and guilt walked Dr. Feingold. His calm reassurance and delight in our daughter’s presence pointed to a better way of looking at ourselves and our child. We realized immediately that he was more than a doctor; he was a mentor and teacher to families in a time of great anxiety. Dr. Feingold and his capable staff helped us navigate the often cruel labyrinth of the insurance system to obtain a complete genetic work up. Through these efforts we discovered that our daughter has a unique genetic birth defect; some genetic material is missing from one chromosome, and there are translocations among others. We will never know the reasons why this happened, but the diagnosis alone has been a godsend. Dr. Feingold was able to draw on his decades of experience working with the whole panoply of genetic birth defects to give us his best assessment of our daughter’s needs and how to serve her. By his example, he also taught us to be attuned not just to her limitations but to her capabilities. Whether it was because of his years of seeing disabled patients realize meaningful lives or whether it was his own unique gift for framing our experience, Dr. Feingold taught us to be open to the possibilities of a bright future for our child. We continued to see Dr. Feingold annually at satellite clinics near our home on Cape Cod. It was always a pleasure to visit with him. When it came to assessing Alice’s general health and educational needs, he was always a great resource, comforting and direct. Finally, where others may have feared to tread, Dr. Feingold counseled us as we contemplated bringing another child into the world. He was able to give us his best assessment of the odds of another birth defect and helped us be comfortable with our decision to try. Today, Alice is ten. She has two healthy and annoying younger brothers, aged eight and four. I am not sure we would have had the wherewithal to grow our family without his wise counsel. We miss him, and we will be forever in his debt.